3D modeling by aerial photogrammetry of a roof and merging on a cloud realized by terrestrial lidar system. Results obtained from 314 aerial images taken by the company Altitude Drone Diagnostic. 3D scan realized as part of the rehabilitation of ski stations in Val d’Isère. The 3D modeling of roof elements by aerial photogrammetry has made it possible to fill all the mask areas inaccessible by terrestrial lidar. 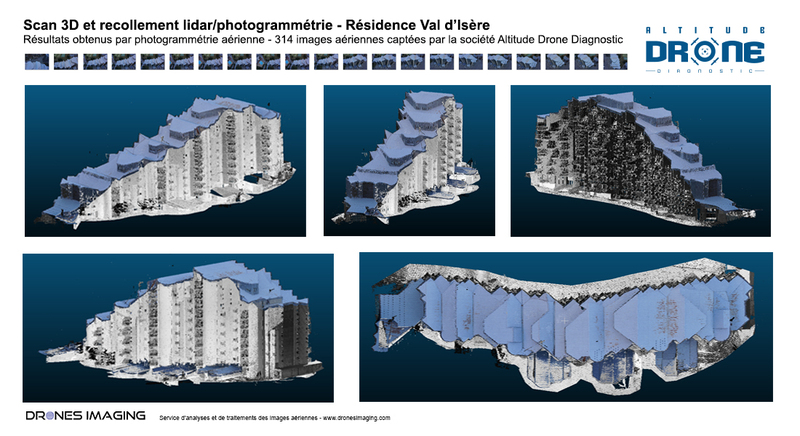 Thus, after having merged the 2 models obtained by terrestrial lidar and aerial photogrammetry, the first residence of Val d’Isère could be fully modeled for an optimal and three-dimensional exploitation with Autocad. Source : Altitude Drone Diagnostic company. Post processing : Drones Imaging company. Final dense cloud : 650 million points.